Between now and November, the UK power market will be focused on the volume and pricing of capacity delivered in the first auction. But industry views range widely as to its commercial impact. What will the outcome of the 1st auction be? How will the capacity price interact with the wholesale power price? What are the implications for generation asset returns? In this article we consider these questions. The countdown has commenced to the implementation of the UK Capacity Market. Between now and November, the UK power market will be focused on the volume and pricing of capacity delivered in the first auction. And the rest of Europe will be watching, given capacity markets are the subject of whiteboard sketches across the offices of the EU’s energy regulators. For all that has been said and written about the UK Capacity Market, industry views range widely as to its commercial impact. What will the outcome of the 1st auction be? How will the capacity price interact with the wholesale power price? What are the implications for generation asset returns? We consider these questions in this, the final article, in our three part series on the Capacity Market. The source and cost of the marginal provider of this incremental capacity. The government will provide a clearer view on the incremental capacity volume requirement (1.) when it publishes its capacity demand curve (scheduled for June). In our view, there is a risk that political influence leans towards a more ambitious capacity target for the first auction given concerns over security of supply. After all, the costs of providing capacity via the Capacity Market are less transparent than via the wholesale power market, and are smeared over a multiple forward year horizon. Once there is more clarity around capacity demand, the key determinant of capacity price will be the cost of the marginal source of supply (2.). In our view the capacity price in the first auction is more likely to be set by existing gas and coal assets rather than new build CCGT/OCGT. This may either be via refurbishment of existing capacity to enhance/extend assets lives, or via existing assets recovering the ‘going forward’ costs required to remain open (as we set out here). However it cannot be ruled out that the government really leans on the capacity lever, pulling the capacity price up to levels that support new build. There are also still a number of unresolved issues around market design which could impact the auction outcome. For example, the length and legal basis of capacity contracts, qualification for price setting ability and the amount and nature of capacity costs that can be bid in. In the current world with no Capacity Market, the absolute level of power prices is driven by the fuel & carbon costs of marginal generators (primarily CCGT). This will not change with the Capacity Market, regardless of capacity pricing outcomes. It reduces the requirement for generators to recover fixed costs via wholesale power prices. Both these factors are likely to put downward pressure on power prices. In order to better understand the dynamics of capacity and energy market interaction, it is useful to use a supply curve framework as shown in Chart 1. The left hand diagram shows a short run marginal cost (SRMC) view of the UK supply stack (net of intermittent generation). The CCGT portion of the supply curve (blue line) which typically sets marginal power prices is very flat, given there is around 30GW of CCGT competing to supply power at similar marginal cost levels. That translates into a flat SRMC duration curve in the right hand chart (the grey line). In a market which has a very tight capacity margin (e.g. the UK in 2016), wholesale power prices rise significantly above SRMC. This yields a steeper price duration curve (the red line in the left hand chart), with generators earning rents above SRMC, particularly in periods of peak net system demand. The principle mechanism that drives these higher rents is reduced competition between marginal generators in setting market price (given capacity tightness). This means marginal generators have a greater ability to price power above marginal cost. However in a market with a more comfortable capacity margin (e.g. the UK in 2019), wholesale power prices are likely to more closely reflect SRMC. Rents are reduced given an increased level of competition between marginal generators at higher capacity levels. 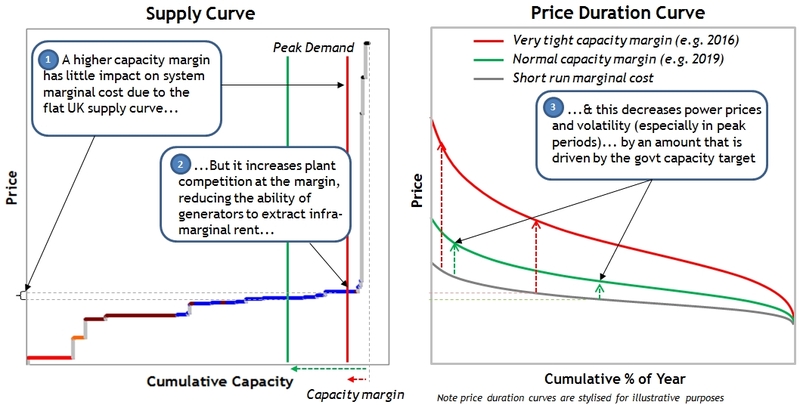 In other words, the ability of marginal generators to price power above marginal cost is reduced and the price duration curve flattens accordingly (the green line in the right hand chart). So implementation of the Capacity Market, combined with delivery of new renewable generation, will mean higher system capacity levels. These factors act to stretch the supply curve, shifting the intersection of supply and demand to the left. This in turn reduces rents in the wholesale market and places downward pressure on power prices. The effect of renewable intermittency in increasing prompt power price volatility is a well understood concept. Fluctuations in wind and solar output stretch and contract the supply stack, causing changes in marginal price setting generation units and hence price volatility. This effect is set to increase between 2014 and 2018, as the system capacity margin tightens and wind & solar volumes increase. But implementation of the Capacity Market may act as a volatility dampener from 2018/19. The factors behind this are the same ones that place downward pressure on power prices. Higher levels of system capacity reduce the system tightness that drives price volatility. And as the focus of fixed cost recovery for peaking assets shifts to the Capacity Market, a reduction in the extraction of peak period rents should dampen wholesale price fluctuations. The Capacity Market will also do little to help wholesale market liquidity. The government’s other EMR reforms have eroded the requirement for low carbon generators to hedge output in the power market. The Capacity Market is likely to have a similar effect on gas and coal generators. As the margin focus of these asset shifts to annual capacity payments, it reduces their wholesale market hedging requirements (particularly for peaking assets). The Capacity Market will have profound structural implications for the margins and risk/return profiles of gas assets. Most importantly it should boost and de-risk plant margins. Capacity prices will fluctuate from one year to the next, but more stable fixed annual capacity payments will reduce asset dependence on volatile wholesale market revenue. While this is good news for asset owners, it introduces a new set of challenges in understanding and managing the interaction between capacity and energy margins. Chart 2 provides a simple illustration of the margin recovery path for gas plant between now and the end of this decade. Healthy system capacity margins and steadily increasing renewable volumes are currently depressing CCGT margins in the wholesale power market. As scheduled regulatory retirements occur mid-decade, the capacity margin is set to tighten which should in turn increase gas plant energy market rents (as described above). Then a new capacity margin stream is available from 2018/19, but one that will have an important interaction with the existing energy margin stream. As long as there is a system requirement for the Capacity Market to deliver incremental capacity, capacity prices are likely to cover the fixed cost base of CCGT assets (otherwise older CCGT plant will close). This, combined with a 4 year forward visibility on capacity revenues, will help support and de-risk the value of CCGT assets. In addition CCGTs will be able to recover capacity margins significantly above fixed costs in periods when the capacity price rises to incentivise capacity delivery. For older CCGT assets, currently out of merit and suffering low or negative cashflows, the Capacity Market is a potential game changer (as long as plants meet the required flexibility standards). The key challenge for asset owners is how to manage margin in the period between now and 2018/19 and how to bid assets into the capacity auctions. Newer CCGT assets running at higher load factor will also benefit from capacity margin, but will retain a significant exposure to the wholesale power market for recovering capital costs. The key challenge here is for asset owners to understand the interaction between capacity and power pricing and to manage, hedge and bid their assets accordingly. As the November auction approaches, asset owners are confronted with a set of decisions on how to manage asset value across the energy and capacity markets. The cost structure and expected energy market returns of individual plant are key factors in defining a capacity bidding strategy. But there are also important considerations around anticipating actions of other generators, pricing capacity based on alternative bids and bidding with a generation portfolio perspective. Most importantly, the Capacity Market has a key bearing on lifetime investment decisions on asset retirement, mothballing, capex spend and refurbishment.